If your tourism in Barcelona is for a weekend, we can recommend a planned route at Hotel Center Gran Via, so you do not miss any main point of interest. The center par excellence of the city is Plaça de Catalunya (we are located a few minutes away) below which is the Casco Viejo and most of the museums and other places of historical interest in the city. The famous Rambla is another of the points of tourism in Barcelona key for the visitor. It winds from the Plaça de Catalunya to the statue of Columbus, next to the port. To the east of the Rambla is the beautiful and romantic Barri Gòtic, while to the west is the Barri del Raval. From the statue of Colom, towards the east, the Passeig Marítim crosses the Moll de la Fusta and the Port Vell; the picturesque area of ​​Barceloneta leads to Port Olímpic. To the west, the Paral.lel takes us to Plaça. D’Espanya, from where Montjuïc stands, one of Barcelona’s main parks. While the Tibidabo mountain, marks the northern limit of the city. The also popular Avenida Diagonal is another important point of reference, since it crosses the entire city diagonally. Between the Plaza de Catalunya and the Diagonal, we find practically all L’Eixample of Barcelona, ​​emerged from the “Pla Cerdà” and whose objective was to unite the center of Barcelona with the nearby towns, which today are part of Barcelona. 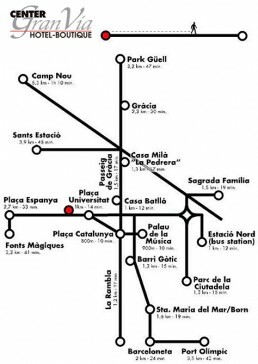 The neighborhoods such as Gràcia, Les Corts, Sarrià-Sant Gervasi, etc. have been able to keep their own historical and cultural identity over the years. This square grid of blocks, L’Eixample, has as its main artery the Passeig de Gràcia where you can find the main modernist buildings of the city, such as the popular Casa Batllo and Casa Milá (La Pedrera) by Gaudí. The Sagrada Família, Park Güell, Barri de la Ribera and Camp Nou. In addition to these attractions, Barcelona has 5 km of free beaches with services, showers, etc. divided into different sections throughout the city, to which you can comfortably move by public transport.